For years, manufacturers of gun safes have looked to technology to improve their products. Keyed locks gave way to combination locks which were succeeded by electronic locks and then fingerprint readers. Each advancement came with its own advantages and disadvantages. This handgun safe from GunBox represents the next generation, the cutting edge of gun security technology. This may be a good or a bad thing; it remains to be seen. The first difference you notice with this safe is that it is not made from steel, as most of the competition is. It is made from aluminum alloy that is described as aircraft strength. This means that the light weight is very deceptive: This is a strong safe. The electronics in the safe require a power source, so there is a power cable that is supplied with the unit and the safe should remain plugged in whenever possible. This doesn’t detract from its portability, however, because it also has a battery backup. And if you want to use this safe in a vehicle a separate power adapter can be purchased. And if even more security is wanted, a Kensington security cable (which also has to be purchased separately) can be attached. On top of all this, the safe is designed so that it can be mounted almost anywhere and in any position. As further evidence of the portability of this safe, it has been approved by the Federal Aviation Authority approved this safe for transporting your guns in your checked luggage. The particular model reviewed here is the mid-range model. It has a biometric fingerprint reader that will hold multiple prints in addition to what is the GunBox’s primary access technology . . . Radio Frequency Identification (RFID). 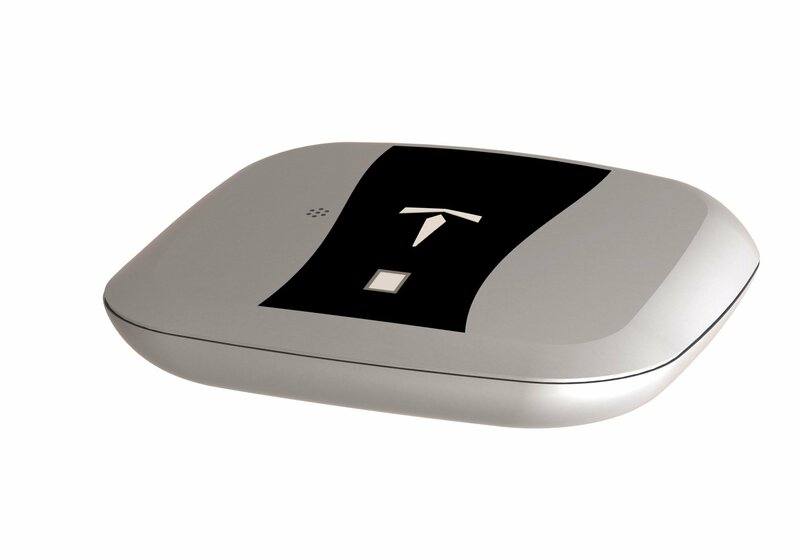 The fingerprint reader or the RFID scanner can be used separately or together for added security. Access is really quick. The RFID scanner can be programmed to recognize the signal from a variety of objects: a wristband, a ring, key fobs, or labels. Wave the object over the scanner and the box will unlock. Only the wristband is supplied with the unit. The other accessories can be bought separately—is anyone noticing a pattern emerging here? In addition to the technology for locking and unlocking the box, there are a few other features to keep the tech-addicts among you happy. Perhaps less useful, or more depending on your priorities, is the inclusion of 2 USB ports, allowing you to use the unit as a charging station for other devices such as your phone. The interior has a neoprene lining, rather than the usual foam found in other safes, to prevent damage to the contents. There is room for one handgun and some accessories. As I write this, there are 115 reviews on Amazon. This gives a rather disappointing average of 3.9 out of 5, and the distinct impression that buyers either love or hate this safe, with very few opinions falling in the mid-range. Most of the negative reviews involve failure of the RFID scanner, the fingerprint reader, or both. It was also pointed out that having an RFID device such as the labels lying around is no different to having a key lying around that could be picked up by children or others. The positive reviews, of course, say exactly the opposite, and those buyers rave about the security and the reliability. After reviewing many gun safes, it has become apparent that the newer and more complex the technology used, the more likely you are to see complaints of unreliability. This is obviously a concern for a product that may need to be employed in an emergency. And this particular product includes the absolute latest in technology. Some people report keeping two handguns in this safe, but it seems to me that this would be a tight fit. It would be far better for a single weapon. If you are willing to pay and take the chance, it is possible that you will be thrilled; it seems that if it works, it is excellent.